By	Allyson Haymaker. Last edited by Marios Alexandrou on March 18, 2019. Cypress Tree Near St. Francisville. Photo by Henry Cancienne. In the beautiful Cat Island National Wildlife Refuge outside St. Francisville, Louisiana, I found the national champion bald cypress tree — it's 83 feet tall, 54 feet in circumference and 17 feet in diameter! Just to give you a sense of scale, that's me next to the tree in the photo (above). 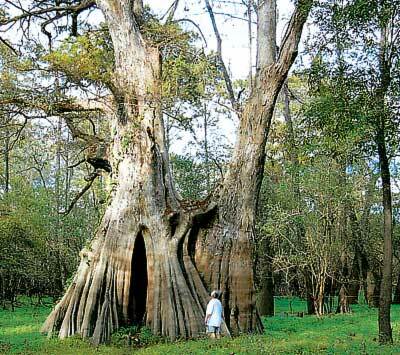 It's the sixth-largest tree in the United States and the largest of any species east of the Sierra Nevada. The tree is about 1,000 years old! The wildlife refuge is about 4 miles west of St. Francisville in southeastern Louisiana, which is at the junction of U.S. Highway 61 and State Highway 10, roughly 30 miles northwest of Baton Rouge and just north of the Mississippi River. To reach the refuge, take Tunica Road north off Highway 10 on the south end of St. Francisville. Tunica turns into River Road; follow it over the low-water crossing bridge that spans Bayou Sara and follow the signs to the refuge. The Mississippi River sometimes floods the refuge to the point that the refuge and/or bald cypress tree is inaccessible, so be sure to call before visiting at 1-225-635-4753.